The Upper East Side’s looser cousin, the Upper West Side is home to lively mix of young professionals, families and college kids. Compared to its stuffy eastern relative, the UWS follows the Manhattan model of mixing commercial with residential spaces in a more organic (some might say slapdash) way. 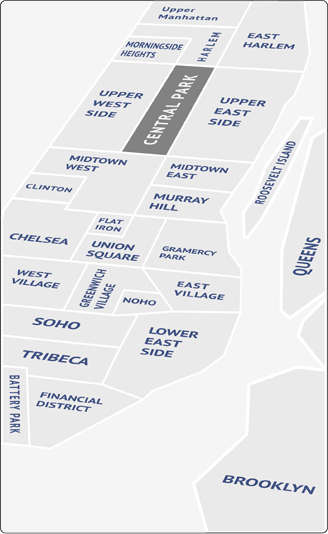 A good percentage of UWS residents live above a restaurant or deli. Running from 59th to 110th Street between Central Park and the Hudson River, it’s like the UES with a little of bit of funk mixed in. The housing reflects the mix of residents: everything from luxury high-rises to tiny tenements. Generally, the farther north you go, the better the deal. Sometimes it seems that there’s nothing to do on the Upper West Side but eat. You can do the historical eat, at institutions like Barney Greengrass; the wallet-sapping eat at Jean Georges; the bargain gourmet thing at Gennaro. It’s all there. Enjoy! Columbus and Amsterdam come alive at night with a diverse range of bars and clubs. Trashy, trendy and everything in between. For more refined pleasures, Lincoln Center is on the southern border, with concerts and plays all year long. Central Park, with its meadows, zoo and concerts is a strong argument for living on the UWS. And there’s no better place for a jog or bike ride than its roadways and paths. On the opposite side of the neighborhood, there’s Riverside Park, a gorgeous strip of real estate that doesn’t attract the crowds of its more famous sister. Expect this neighborhood to only become more popular as time goes by, enduring even the softer markets.